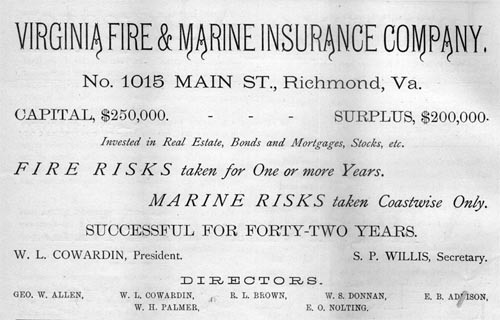 Virginia Fire & Marine Insurance Company. No. 1015 Main St., Richmond, Va., Invested in Real Estate, Bonds and Mortgages, Stocks, etc. FIRE RISKS take for One or more Years. MARINE RISKS taken Coastwise Only. SUCCESSFUL FOR FORTY-TWO YEARS. W. L. COWARDIN, President. S. P. WILLIS, Secretary. DIRECTORS; GEO. W. ALLEN, R. L. BROWN, W. S. DONNAN, E. B. ADDISON, W. H. PALMER, E. O. NOLTING.